The bent pyramid is located about 40 km away from Cairo at the royal necropolis of Dahshur. It was built by the great pharaoh Snefru and it was actually the second pyramid built by him. Bent Pyramid appears a transitional form between smooth-sided and steep-sided pyramids. Because the original angle of inclination showed some steepness, the structure showed signs of instability during construction. This forced the builders to adopt a shallower angle to avert the structure’s collapse. It is sometimes called the Rhomboidal. Bent Pyramid of Snefru is a truly unique one among the ninety other pyramids found in Egypt because its original polished limestone outer casing remains largely intact. The ancient name of the bent pyramid is translated as the Southern Shining Pyramid, or Sneferu is Shining in the South. There are two entrances for bent pyramid and each one of them leads to a chamber of a different high. The northern entrance leads to a chamber that is below ground level whereas the western to a chamber built in the body of the pyramid itself. In the first half of the 1950s, Ahmed Fakhry started some archeological studies of the Bent Pyramid. There are three sections inside bend Pyramid. In the southern section, there are four storerooms and the sidewalls are decorated with scenes depicting representations of personified mortuary estates. Upper Egyptian sources are displayed On the east wall. On the west wall, you can find Lower Egyptian funerary estates. These reliefs some of the best artwork of the 4th Dynasty, and are the earliest known examples of such estate scenes. A huge wall built probably of local yellowish, gray limestone surround bent pyramid. 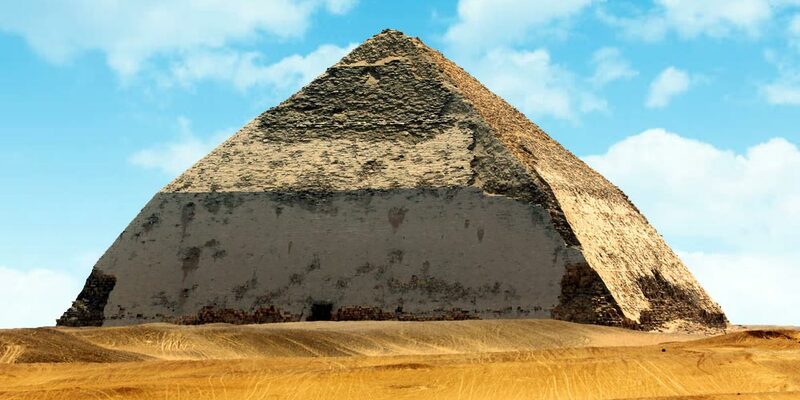 The angle of the slope was reduced to 45o during the construction work, which had the effect of reducing the mass of the upper part of the pyramid. Many tourists customize a special trip to visit bent pyramid during their Cairo day tours. Why is The Bent Pyramid at Dahshur in Egypt…Bent? Because of the steepness change in slope, the pyramid is called bent as the lower part of the pyramid’s outline is angled inward at 54 degrees, and then at 49 m above the base, the slope abruptly flattens out to 43 degrees. That leaves a distinctively odd shape. There have been several theories about why the bent pyramid was made until recently. They included the premature death of the pharaoh, requiring the speedy completion of the pyramid in addition to that noises coming from the interior clued the builders into the fact that the angle was not sustainable. There are some questions related to the bent pyramid whether all of the pyramid’s chambers have actually been located in addition to some investigation of the pyramid was sometimes difficult, because wind created a potent draft blowing through the passageways. Because of this, the archaeological studies were hindered. These problems occurred even before the discovery of the walled-in western entrance, so some current Egyptologists wonder how the draft was vented, and leading them to speculate that other rooms or passageways might remain undiscovered. There are some remains of the bent pyramid temple on the east side of the pyramid and there are two stelae behind the temple. It is presumed to be similar to that of the Medium temple and it is the first valley temple we know of to be connected to a pyramid complex & was enclosed within a huge perimeter wall made of mud brick. On the southern side of the pyramid, there is a satellite pyramid that was built to house pharaoh Ka and it measured 26 meters in height and 52.80 meters in length. We offer amazing Egypt tour packages to explore the most enjoyable sites in Egypt. You will discover the fascination of Egypt’s history by visiting Cairo, Aswan, Luxor, and the other glamorous cities on the Red Sea.